Any more info on the JFK coin/ring? I don't know a great deal about US coins but I suspect that this is a half dollar issued in 1964 to commemorate the death of JFK. Like our Royal Mint their mint does not normally issue coins wrapped inside jewellery. This will have been done privately. There was a mad rush for these coins in the aftermath of his death and they are rarely found in circulation in the US due to their being snapped up by enthusiasts and collectors. A bit like some of our Beatrix Potter and Kew Gardens 50p coins here. For that reason they may well be worth a good sum of money. No idea how much though as I don't have their reference book. I think their annual coin manual is called the 'red book'. No doubt it will be available on line if someone wants to look to see how much it is worth. Good luck. A true Vintage 14ct JFK Memorial Ring made of yellow and rose gold c.1965 u.s. hallmarked and good value at $575 aus. The ring is made of 14ct yellow gold band with rose gold shoulders to match the copper in which the memorial coin is made. 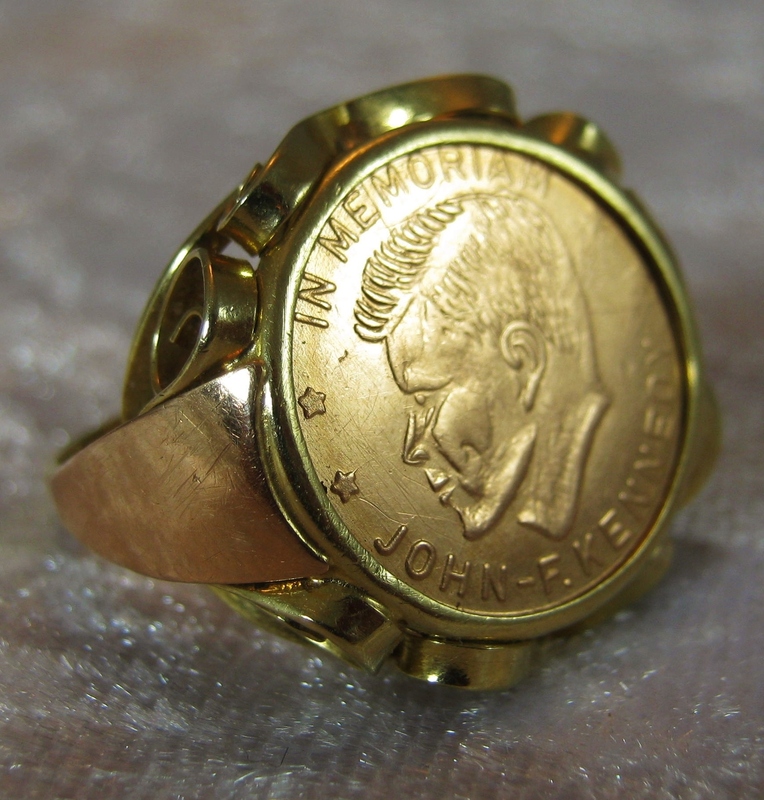 This great collectors 14ct JFK Memorial Ring has detailed scroll work around the circumference of the coin and a facial image of JFK and inscribed in memorial to John F Kennedy. Created in the sixties this 14ct JFK Memorial Ring is a tribute to President Kennedy. He was a true Patriot and loved the people of the United States. Unfortunately he was assassinated for trying to rid the government of corruption and trying to bring back the gold standard and a treasury backed dollar. A beautiful ring and a Great Tribute to a Great Leader! Coin update - just received the last in the 2018 Beatrix Potter 50 pence collection - 4 in all. Mrs Tittlemouse, (titter ye not!). This makes 13 in all since the 2016 issue. Would make a great starting point for anyone looking to make up a coin set - all 13 are in circulation. If you can't wait to get them in your change - they are all available in Brilliant Uncirculated or Proof condition from the Royal Mint and other good coin dealers. Coin info' - for some reason there has been an upsurge in people advertising £2 and £1 coins with 'the edge lettering the wrong way up'. Some of these coins have been advertised for £200 and more. There must be a market as people continue to advertise them. It is nonsense. There is no such thing as edge lettering the wrong way up, it is a completely random process. Please don't be fooled by these scams, don't take my word for it - check via the Royal Mint or other reputable websites. I got a Magna Carta £2 coin today, they are quite rare aren't they? Willthiswork wrote: I got a Magna Carta £2 coin today, they are quite rare aren't they? Not really. Its a Newport County type coin - just above mid table on the £2 coin scarcity index. I'd keep it if you intend to get the full set of 37 £2 coins. Worth about £3.50 on eBay. Not worth selling when you include fees etc. Coin update. The new 50p Paddington bear coin has been released. It appears that the Royal Mint have jumped on the popularity bandwagon of the Beatrix Potter series and issued this new one to celebrate Paddington's 60th anniversary. For those interested, it has been reported that there are a lot of variations in the new £1 coin. They are not all the same as there have been a lot of errors in the milling process, subsequently all coins have not been struck to the same standard. I can point you in the direction of a great article about this for those who are interested. They may be worth something in the future. There has also been further confirmation of 'dated error' £1 coins. A few coins have different dates on the obverse and reverse and they are worth quite a bit of money. I have one with 2017 on one side and 2016 on the other. It is quite difficult to see and you do need a magnifying glass but they are out there if people care to look. pembsexile wrote: Coin update. The new 50p Paddington bear coin has been released. It appears that the Royal Mint have jumped on the popularity bandwagon of the Beatrix Potter series and issued this new one to celebrate Paddington's 60th anniversary. Apparently HM the Queen asked the Mint to produce Paddington coins as it's a particular favorite of hers. I don't see the point of buying them or getting them direct from the Mint. The fun of collecting them is getting them in your change for me!